The Magnifying Glass starts the 12th week of the TOP 16 with the analysis of the big game of Olympiacos against Efes in Greece. If we can talk about Basketball miracles, then Olympiacos definitely achieved one of them with the big win against Efes, assuming that the Reds were playing without the 2 best backcourt players in terms of attacking and creating efficiency (Spanoulis and Sloukas). With these absences Olympiacos was looking for good offensive post-game and transition in every opportunity. Moreover they needed good execution in every opportunity. The two teams had different defensive strategy. Olympiacos tactically preferred to switch in every screen in order not to give space and time for executions and penetrations from Heurtel and Draper. This was an effective plan if we just see that together Heurtel and Draper scored 6 points with the French star scoring the 3 of them with a fast break 3pt shot. In 40 minutes they Reds kept them in only 3 points in 5 vs 5 game. This defensive plan contained some risks although. Efes was all the time having miss matches inside the paint with their players hitting them in every opportunity early on. They did it with execution from the paint or with creation from inside, when the help was coming mostly from the weak side. Efes played great the weak side passing game for 3 quarters, finding open shots for Janning, Batuk and Perperoglou. When a team is defending with switches the double teams and the rotations must be very attacking in order to force more difficult executions or turnovers to your opponents. As the game proceed Olympiacos became more quick and more attacking in the double teams, the hedge out defenses and the rotations and this was one reason of their win. The other reason was the way the backcourt players played the whole game. Without stable threat from the post and with limited transition plays, Olympiacos needed from their guards to attack. Mantzaris and Lafayette stepped up and they attacked in the defense of Efes that preferred not to switch but to give some spaces, thinking that Mantzaris is not executing and Lafayette is not penetrating. Both of them did what the defense of Efes thought they are not capable of. Mantzaris and Lafayette penetrated and executed in every opportunity damaging the defensive plan of the Turkish team. Moreover even though Lojeski was playing in 2 (shooting guard) position (away of his favorite weak side execution game), he was very effective in terms of creation, taking screens in the wings and hitting with his passes the rotations of the Turkish defense. And the result of all these was insane. 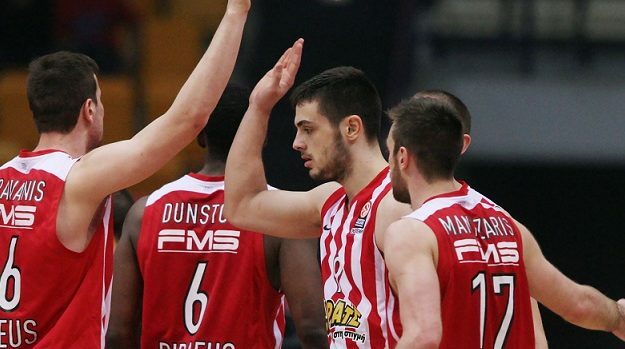 The 3 of them contributed for 35 points and 16 of the 19 assists of Olympiacos. Without Spanoulis and Sloukas these are numbers that nobody expected from the backcourt of Olympiacos. For 30 minutes Olympiacos was without stable game in the post, without transition, with less than 50% from the free throw line, and less than 25% behind the 3point arc. Despite all these facts the Reds were still in the game and this is a Basketball miracle. In the 4th quarter Olympiacos found their usual pace and co-operations in offense, but everything started from one of the purest Greek talents Ioannis Papapetrou and his variable and classy offensive game. Execution form the perimeter, threat from the post and creation of the dribble. He scored 10 points in the beginning of the 4 the quarter, Lafayette added to big 3pointers after screen and the Reds found also 2 more big shots after good ball movement and execution from the weak side from Printezis and Lojeski. Definitely this was a gutsy win for Olympiacos, win that build characters and gives the players confidence and momentum!